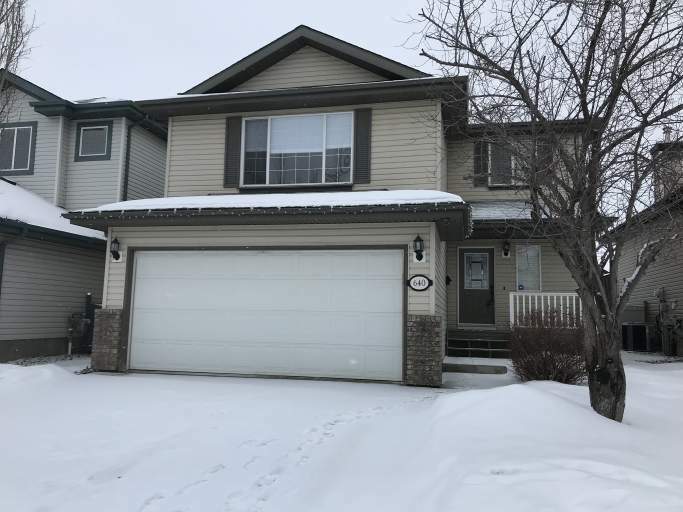 Amazing Four Bedroom Home in the West Edmonton Glastonbury Community! Glastonbury offers easy access to the rest of the city via the Anthony Henday Ring Road and Whitemud Drive while also offering major amenities like Costco, Save-on-Foods and more! Plus, tons of parks and green spaces dot the area, including Guinevere Park and Pond! The home itself offers a great layout including a finished basement and a massive fully fenced backyard! Plus, tons of extras, including central air conditioning, a water softener unit, and a built in central vacuum system! Enter through the front door and find beautiful brown laminate flooring, large windows and tons of open space! Continue into the living room and be greeted by a corner gas fireplace with tile surround, a large window with a view of the backyard, a perfect space for relaxing or even entertaining! The kitchen boasts stylish countertops paired with black appliances including a full-size fridge, stove, microwave and even a dishwasher! With matching black tile backsplash, a large island with a double sink and a large pantry closet, this kitchen is sure to impress! Off the kitchen is a dining area, perfect for a large table and chairs set. Off the front entry you'll find access to the garage through a tiled mudroom area which is also home to front loading laundry machines and a half bathroom! The upper level is home to a large master bedroom with laminate flooring and its own private full bathroom complete with a tub shower! Two more additional bedrooms with laminate flooring and another full bathroom with a tub shower complete this functional level. The basement level is fully finished and home to an additional bedroom, a small bonus area as well as a large storage/utility room. The massive backyard offers a large deck with access from the dining room, along with tons of green space and a large storage shed. Call or email today to schedule a viewing at this amazing home! Small Lap Dog may be accepted, subject to approval and $250.00 Non-Refundable Pet Fee.